The Battle of Odessen kicks off in a couple of weeks. 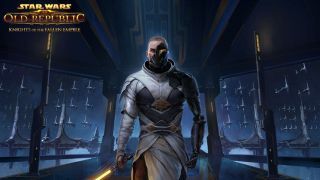 "In The Battle of Odessen, Arcann launches an all-out assault against the Outlander’s base. Still recovering from a shattering betrayal of the now-renegade droid, SCORPIO, the Outlander’s Alliance must rally to defeat Arcann’s forces in a desperate battle to determine the fate of the galaxy once and for all." In addition to that story content, you can choose to join the 'Dark vs. Light' event for a bunch of challenges, to earn new rewards, and to make light side/dark side choices that will "ultimately impact the fate of the galaxy". Sounds like a lot of pressure! I might just sit here and eat space-crisps instead. Oh but I'll be missing out on a "unique dark or light side companion", if I complete the event's 'Eternal level'.